Looking to escape the city for a day, go on a ferry ride, and see what the islands are like? Then a day trip to Whidbey Island is what you need. This can be a short trip or take the whole day to visit the island. Drive north to Mukilteo and catch the WA State Mukilteo to Clinton Ferry. Once on the Island drive up the Scenic Hwy 525 and make your first stop, the historic town of Langley, home of great galleries, antique shops, and wonderful beach walks. Enjoy great views of Saratoga passage to Camano Island; keep your eye out for bald eagles or blue heron fishing. Further up the road there is a lot to do, stop at Greenbank Farms with its fields, wetlands, and hiking trail, check out the wines at Greenbank Cellars, and see the Meerkerk Rhododendron Gardens or keep going up the island to Fort Casey State Park. Watch for bald eagles in the park or enjoy a great beach walk and views of the Olympic Mountains. 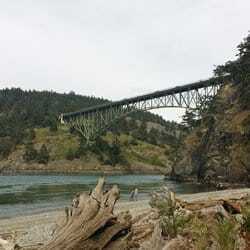 Back up the main highway, drive through the navy town of Oak Harbor and keep going to Deception Pass, one of the most beautiful places on the island. Enjoy the State park with a hike on both sides of the pass and enjoy beautiful view of land, water and mountains all around you. When you day is almost done, continue over Deception Pass Bridge, and follow the signs to Hwy 20, then back to I-5 South and home to Seattle!